Why do snakes always hang around ladders? Why do ladders only allow upwards climbing? Why are we climbing the ladders, and what's so bad about staying at the bottom? It's possible we'll learn the answers to these pertinent questions in Snakes-N-Ladders: Origins, which is a modern first-person shooter take on the Snakes N Ladders universe. No doubt there will be plenty of gripping Snakes-N-Ladders lore to sink our fangs into. "Millions of years ago there waged a devastating war between humans and reptilians for control over the galaxy," reads the official Steam Greenlight description. "Knowledge of this war has been passed down the ages and now exists in the form of a board game which is played to this date." Sounds pretty good! It's a Greenlight project so the quality of the end result may vary, but overall I think it's about time someone delved head first into the rich possibilities of the Snakes and Ladders universe. 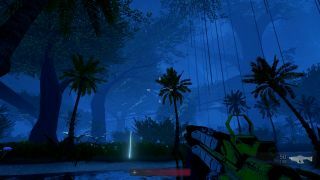 "Episode 1 is a small game comprising of 6 levels in one giant earth-like swamp forest valley on an unknown planet," continues the description. "It delves into first contact between the two races and how the whole legend began. It is the stepping stone into the vast Snakes-N-Ladders: Origins saga to come." Check it out here. Hopefully someone will consider developing a Hungry, Hungry Hippos RTS set in a gritty, post-apocalyptic hellscape.